Language is the way we communicate with each other so words and how we use them are important. Any conversation about downsizing and decluttering, whether written or spoken, almost always incudes the frequently used catchphrase “Reduce, Reuse, Recycle.” All the words in that phrase start with “re-” a prefix that comes from the Latin and means “again” or “again and again” to indicate repetition, or it can mean going back to do something again, as in redo or revisit. I’m revisiting my thinking about that standard: Reduce, Reuse, Recycle. Reduce means to use less and is certainly a good place to start. Reduce means to have a smaller or lesser amount, or to bring down, to diminish, or to minimize the amount we have. And in some definitions, it means to restore, to bring back or to lead back, to its original or lower state. So if the first step in decluttering is to reduce, then one meaning is to bring ourselves back to our original state of needing or owning less. Perhaps thinking of “reduce” in that way, that our original state is one in which we need less, we will have an easier time of getting rid of the things we no longer need, or at least, maybe, we’ll be able to do it with less angst. Reuse means to use something again, usually for its original purpose. Most of us have worn a dress or outfit again, getting multiple uses out of our clothes, and all of us reuse our dinner plates and cutlery every day. So reuse is a part of our daily life, a no-brainer. But another definition of reuse is to use something again for a different purpose, sometimes called creative reuse or repurposing. Our forebears used pieces of fabric salvaged from clothing or household items to create bed quilts. Currently, many animal shelters ask for used bedding and pillows to use as animal bedding. Sometimes we reuse by passing along our older child’s clothes to our younger child, or by giving clothing that’s still wearable to a neighbor who has a still younger child. When we were cleaning out my aunt’s closets, we donated a number of pairs of elbow length gloves to a local theater group: clothing from the past to be used as part of a costume. Recycle means, according to one dictionary, to collect and treat what would otherwise be trash so it can be used again. We recycle paper, sometimes by writing on paper that’s already been used. My father-in-law used the back of legal size envelopes from his mail to make lists, a habit I have incorporated into my life. They are the perfect size and shape for a list. We can print on both sides of paper or go ‘paperless’ by emailing everyone the agenda before a meeting; all are ways to to save trees. 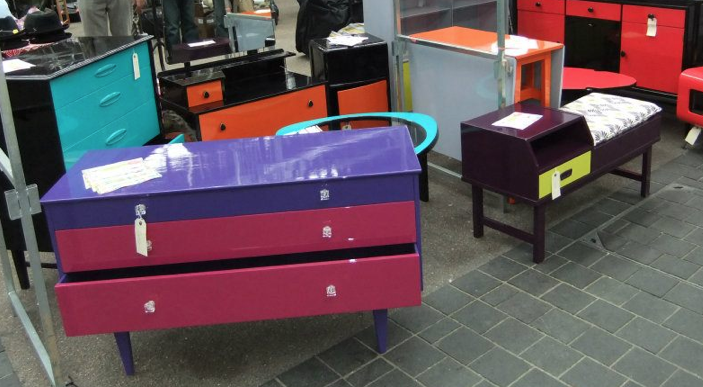 Upcycling, or creative reuse, is the process of transforming old or discarded items into new products that are sometimes better than the original. At a crafts fair I went to last weekend, I saw crafters who had cut off the sleeves of old sweaters and fashioned them into fingerless mitts, and others who had felted old sweaters (washed them in very hot water to cause the fibers to lock together) and used that stronger fabric to make purses. In a fully circular economy, we would be continuously using and reusing everything, reducing greatly what goes into the landfills. We can take old thinking about our stuff and repeal it, replace it, reverse it; we can rethink what our stuff means to us. We can think about resale – having a yard sale for toys that our kids have outgrown or taking our clothing to a resale shop – rather than tossing it. We can reedit or refine our needs, both clothing and household. How many multiples of things do we really need to have. We can refuse things that don’t work for us, even pens that are given out for free, and rethink things are not environmentally friendly. We can retire old thinking. We can show respect – for ourselves and our fellow beings, for all creatures, and for the earth. As we celebrate the founding of our country with picnics, parades, and fireworks, let’s also give some thought to the future of our country, specifically the land we live on. If you are moving, trying to declutter your home, or emptying a home after the owners have left, you have many decisions to make. If deciding on how to dispose of each and very item in the house is just too much, there is help out there. Here’s a look at some companies that will lend a hand. Junk removal companies ensure that, for a fee, what you don’t want or can’t use any longer is recycled, donated, or disposed of responsibly. The list of items they pick up and dispose of includes clothing, linens, old furniture, mattresses, appliances, electronics, sports equipment, tires, construction debris, yard waste, and can also include garage, attic, and basement cleanup. The following two nationwide junk removal companies have received great feedback on the job they do. Since 1989, they have saved over 1.5 billion pounds of junk from being dumped in landfills. Their credo: We believe that together we can make a difference for future generations by focusing on responsible environmental practices today. We are committed to improving our environmental performance by measuring the amount of junk collected and reporting where it goes. “Hunks” stands for honest, uniformed, nice, knowledgeable, students. Their mission is to move the world, one community, one home, one family at a time. They will sort, load, haul, recycle, donate and dispose of every last item that needs to go. To find local organizations that do the same or similar work, search online under ‘junk removal services.’ There are also free services for special items, such as scrap metal. Keep America beautiful; recycle your waste. 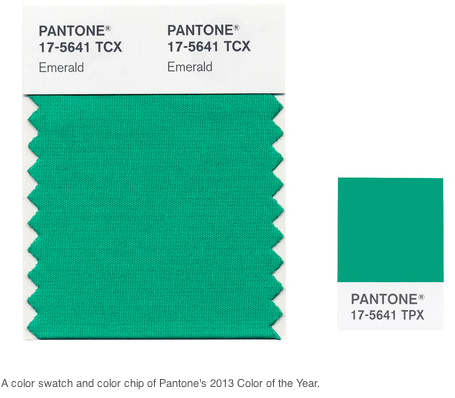 Pantone, a company that is the global authority on color and one that provides professional standards for the design industry, has proclaimed Pantone 17-5641 Emerald as the Color of the Year for 2013. The adjectives Pantone uses to describe the official color – in any order you arrange them – read like a poem celebrating the essence of being green. With green as our focus for this year – in our decorating and in our lifestyle choices – let’s join our fellow stewards of the earth, people and organizations that help us take better care of our planet. Here’s a list of some of the ones that are doing great work. On this Valentine’s Day and throughout the year, let’s color everything green. According to Earth 911, in 2011, only 9 percent of the millions of tons of carpet and rugs that were discarded that year were recycled. 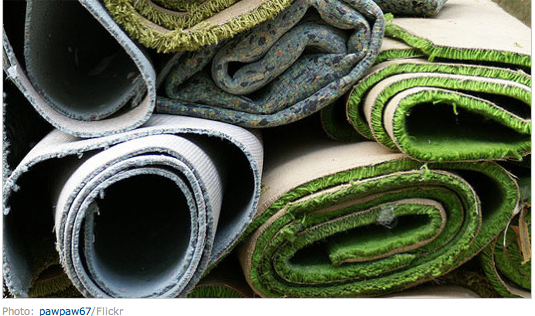 Why are carpets and rugs are one of the least recycled household items? For the homeowner, carpets are heavy and bulky to transport and it’s much easier to simply dump them in the trash. For the recycler, carpet is a challenge to work with because it’s made of different fibers and backing fabrics and each has to be recovered and reused separately. Recycling Old Carpet: Is it Possible? Check out the Carpet and Rug Institute’s article Recycle, Recover and Reuse for another look at recycling. The Carpet Recyclers’ site has a video that shows the recycling process. And go to the Carpet America Recovery Effort’s (CARE) site for a list of places, by state, that will recycle carpet. You can donate worn but clean pieces of carpet to animal shelters, turn them into cat scratchers, use them for insulation, or save one rectangle to use as a welcome mat. Check out these sites for some more practical suggestions. This Old House’s article 10 Uses for Carpet Scraps. 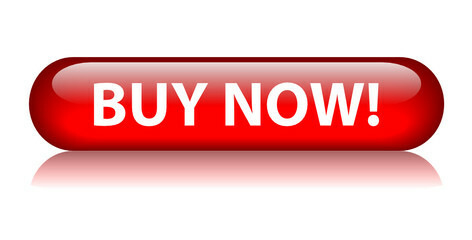 Used Carpet Melbourne: Ten Things You Can Do with Your Old Carpet. Build-It-Green Coach’s Creative Ways to Reuse Carpet. You can reduce your need for new carpeting by extending the life of the carpet you have. See Creators.com’s advice on how to care for your carpet and how to create a patch for a damaged area. It’s always good to be green! Have you ever wondered what happens to the clothing, shoes, and books that you donate? How do charities deal with the t-shirts too stained too wear, the worn-out sneakers, and the books with the damaged covers that are donated along with very usable items? We all envision – maybe even fantasize – that our cast-offs will be used by someone who needs them and will cherish them as much as we do. Some of our items will find loving homes, of course, but recycling the usable parts of unusable items is just as important and we’ve found some places that do just that. A blogger in England decided to check out the path that items take from initial donation to final use at Oxfam, a leading charity in England that fights global poverty. In her intriguing post “Old clothes don’t go to heaven. They go to Milton Keynes” about her visit to the Oxfam warehouse in Milton Keynes, a town north of London, she discovered that VHS tapes and CDs, for instance, are recycled by parts, the video or CD in one place, the paper covers in another, and the plastic box or case in yet another. Books get their barcodes scanned: Popular ones are sold on Amazon or eBay, unpopular ones are sold as props for films and TV, and damaged ones are sent directly to paper recycling. GrowNYC’s clothing and textile recycling collection has set up easily accessible drop-off sites at numerous Greenmarket farmers markets in New York City. New Yorkers toss an average of 46 pounds of clothing and textiles in the trash each year, an amount that’s probably similar for all Americans. To keep those fabric items out of the landfills, GrowNYC recycles clothing, linens, shoes and bags, belts, and fabric. The items are sorted by usable/non-usable cotton, cotton blend, and synthetics, and then sold for reuse as clothing and linens, or to recycling markets to be made into cleaning rags, fiber for car seats, and insulation. Nike’s Reuse-A-Shoe is part of the company’s effort to use the most sustainable methods possible in its production and it has set up more than 300 locations to make donating easier. The donated shoes are cut into three slices – the rubber outsole, the foam midsole, and the fiber upper – and then ground up. The rubber outsole is recycled into tract surfaces, gym flooring tiles, playground surfacing, and new Nike products. The foam midsole is used to cushion outdoor basketball and tennis courts, and the fiber uppers are used for cushioning pads for indoor synthetic and wood courts. Kudos to all the companies and organizations that keep what too many of us see as trash out of the landfills. They find ways to reuse and recycle – and provide yet another reason for us to follow the “reduce, reuse, and recycle” credo as we declutter and downsize our homes. Recycling Tips: Old Socks? Corks? Cereal Box Liners? On the other hand, you don’t really know what to do with these things, either. So they stay in your house, cluttering things up, driving your family insane. Well, it turns out you and I are not alone! I decided to do a little Internet search to see what kind of advice was out there for what to do with some of those items hanging around our house, starting with the first three that came to my mind (or crossed my field of vision): old socks; corks from wine bottles; and cereal box liners. I found an abundance of sites where other ecologically-minded people are figuring out what to do with these pesky items. What are some of the items YOU are holding onto because you don’t know what to do with them? We’d love to hear about them. We’d also love to hear your creative ideas for what to do with some of these pesky items, and we think our readers would too. We hope you’ll share your ideas for recycling/reusing pesky items in the comment space below! Today marks the official beginning of summer: we’ll be on an every-other-week schedule until the end of August. Look for our posts every two weeks, on Thursdays. Happy summer, and happy downsizing! Some very creative people have taken those words to heart. They show that while it’s good to be green and use what you have, it can be fun, too, to think of the advice to Reduce, Reuse, Recycle in clever and unique ways. Saving just one paper towel per person per day, says Joe Smith in his amusing TEDxTalk, will help reduce the 571, 230,000 pounds of paper towels used by Americans every year. Reusing items that would otherwise end up in the landfill is an earnest endeavor but there is nothing serious about the refurbished pieces from Retro Revival Furniture (shown above). The furniture is bright and fun and charming. If weathered wood and pastel tones are more to your taste, check out a remade dresser from Design Sponge. Recycling items to give them a new and sometimes upscale purpose, or upcycling, is a way to help save the planet. 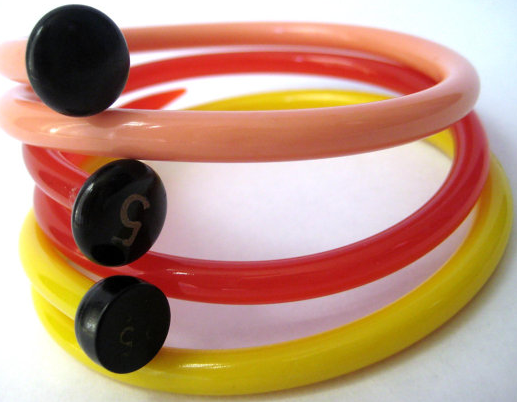 Lynda Slade has upcycled vintage plastic knitting needles, some with Bakelite tops, into bracelets, as shown on the site Unconsumption. 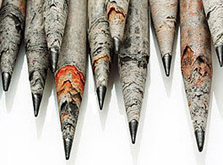 TreeSmart has created pencils from recycled newspaper. And using recycled items for a new purpose is not a recent idea as Good Design shows us. 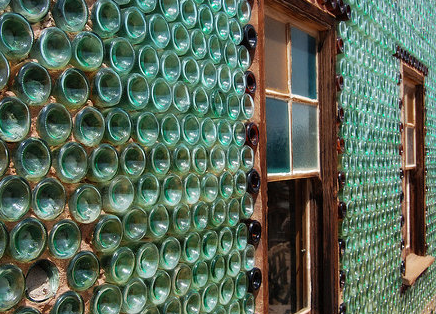 This old house in the ghost town of Calico, California, was made entirely of glass bottles reportedly scavenged from local bars. Ingenious, creative, helpful, yes, and each of these creators has made a bold statement. Who inspires you to reduce, reuse, and recycle?